Dana Dolly "Perm" 65mm ball adapter. For use with all Dana Dolly systems. Allows the adapter to be mounted to the Dana Dolly, with better leveling capability and for 65mm ball heads with short studs or limited tie down threads. 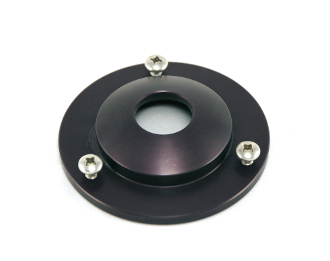 Aluminum and Stainless Steel, Hard Anodized, Made in USA. May not work with Non-Dana Dolly sliders. Important to check 65mm and not 75mm ball.